She embodies characters and parodies their perceived skillsets. Kate Berlant will open for folk singer Father John Misty at the Wiltern this Saturday (November 2). Here are seven strange and compelling facts about her. ❶ Berlant got her start performing at open mic nights in L.A. “I would go to the Laugh Factory and do a set. 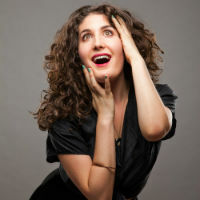 I wasn’t old enough to get in, so I got a fake ID.” Today, Berlant hosts Crime and Punishment, a popular weekly comedy showcase at NYC Lower East Side stalwart Cake Shop.